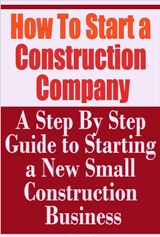 This guide will walk you step by step through all the essential phases of starting a successful construction based business. To profit in a new construction business, you need to consider the following questions: What business am I in? What do I sell? Where is my market? Who will buy? Who is my competition? What is my sales strategy? How much money is needed to operate my firm? How will I get the work done? What management controls are needed? How can they be carried out? And many more. ~ Things to consider before you start - crucial things you must consider before you start pouring in your hard earned money. Ignore it at your own peril. ~ How to plan and start your new construction business - complete, step by step instructions, this is must-know must-do information; ignore it and you stand a good chance to fail. You get specifically designed instructions for each phase. ~ How to develop winning marketing strategies for your construction business. ~ How to plan and execute a results driven advertising program - tips and strategies to make your advertising pay off big. ~ How to find new customers - new customers and more sales are essential for profit and growth. Here's a little known yet extremely effective ten-step formula to locate and find new customers. This same formula helped one client of ours to increase his customer base by 46% last year. ~ Checklist for going Into business - things you must consider before going into business, keeps you from costly mistakes when starting a new business. ~ How to reduce costs - a complete step-by-step organized program for cutting costs in your business. Clients of ours have achieved an average of 28% to 35% cost reduction with this technique, and you can too. Keep the money in your pocket with this one! ~ How to get business loans - where do you go for the financing you'll need? your real options plus tips on which is best for you. ~ All these and much much more. If you are thinking about going into business, it is imperative that you watch this video first! it will take you by the hand and walk you through each and every phase of starting a business. It features all the essential aspects you must consider BEFORE you start a business. This will allow you to predict problems before they happen and keep you from losing your shirt on dog business ideas. Ignore it at your own peril! Sample Content: What Business Am I In? At first glance this may seem like a rather silly question. You may say, "If there is one thing I'm sure of, it's what huskiness I'm in." But wait. Let's look further into the question. Suppose you say, "I build houses." Are you a speculative or custom builder? Are you a remodeler? Are you a subcontractor? Can you schedule a complete job and make money? By planning according to this decision, you should realize the value of this type of thinking in dollars. Consider this example. Bob Rogers started a small construction business shortly after World War II. Because of Mr. Rogers' skill and talent for design, he directed all his activity toward building taverns. There was enough call for this type of building to keep him and his crew busy until the early 60's. Then sales began to fall off. By moving his shop to smaller quarter with less overhead and by laying off half his crew, he was able to maintain his business to his satisfaction the rest of his life. After his death, his son examined the situation and decided that he wasn't really in the business of building commercial bars. He was in the business of custom finishing. Today his business is prospering. He is building cabinets and small bars for private homes. His company also does other finishing work which requires the craftsmanship his crew is capable of. In the space below, state what business you're really in. What are your reasons for this opinion? When you have decided what sort of construction business you're really in, you have made your first marketing decision. Now, in order to sell your service or product, you must face other marketing decisions. Your marketing objective is to find enough jobs at the right times to provide a profitable continuity for your business. Your job starts must be coordinated to eliminate the down time between jobs. In other words, you want to get enough jobs, starting at the right times, to keep from being broke between jobs. Unless an individual can come up with enough ideas to keep a crew working 12 months a year, maybe he or she is not ready for a construction business. Describe your market area in terms of customer profile (age, school needs, income, and so on) and geography. For example, if you are a custom builder, you may decide to build homes in the $180,000 to $500,000 price range. This would mean that your customers will have to have incomes in that class ranges. You may also decide that you can profitable build these homes on the owner's lot if it is located within a radius of 30 miles from your office. (The significance of a customer profile is that it will help you narrow your advertising to those media that will reach the potential customer you have profiled.) In the space below describe your market in terms of customer profile and geography. Now that you have described what you want in terms of customer and location, what is it about your operation that will make these people want to buy your service? For instance, quality work, competitive prices, guaranteed completion dates, effective advertising, unique design, and so on. You have determined what it is you're marketing, who is going to buy it, and why they're going to buy it. Now you have to decide on the best way to tell your prospective customers about your product. What should your advertising tell prospective customers? What form should your advertising take? Ask the local media (newspapers, radio and television stations, and printers of direct mail pieces) for information about their services and the results they offer for your money. How you spend advertising money is your decision, but don't fall into the trap that snares many advertisers. As one consultant describes this pitfall: It is amazing the way many business managers consider themselves experts on advertising copy and media selection without any experience in these areas.